Found in apples, tea, grapes and other foods, Quercetin is plant flavonoid which can support your immune system. BIOVEA® Quercetin adds a Citrus Bioflavonoid Complex. Quercetin is a flavonoid used for over 30 years to boost resistance to food and respiratory allergies. Its biological effects are mainly due to a specific synergy with vitamin C (Quercetin and vitamin C protect and regenerate each other) and to wide-ranging, multi-functional anti-inflammatory activity. Quercetin inhibits the enzymes cyclo-oxygenase and lip-oxygenase, reducing production of the key inflammatory mediators: prostaglandins and leucotrienes. This wide range of activity means it can be recommended for all inflammation. 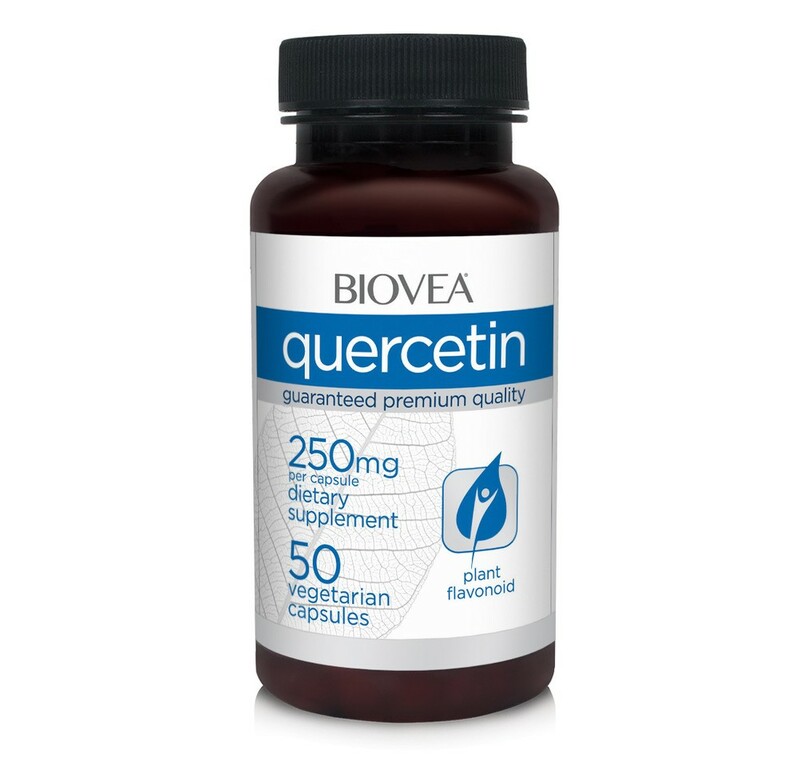 Quercetin inhibits production of histamine by stabilising basophils and mast cells. Histamine is directly responsible for most of the unpleasant symptoms associated with allergies (sneezing, itching, etc). Quercetin acts directly on the intestinal tract to reduce reactions to dietary allergens. A 5-year study of 809 men showed that higher consumption of quercetin cut global cardiovascular risk by a third. Quercetin has proven anti-thrombotic and vasodilatory effects. Risk of stroke is inversely proportional to Quercetin intake. Those with the lowest intake have a four times higher risk. Quercetin protects the kidneys from the recognised toxic effects of certain drugs (cyclosporine). Quercetin significantly improves symptoms of prostatitis and chronic pelvic pain syndrome. Quercetin’s health benefits have long been tempered by its relatively poor intestinal absorption, which meant a large number of capsules had to be taken every day in order to gain these benefits. Other Ingredients: Hydroxypropyl methylcellulose, vegetable magnesium stearate, silicon dioxide. Take two (2) capsules, one time daily, with a meal. Warning: If you are pregnant or lactating, consult a health care professional before using this product. KEEP OUT OF REACH OF CHILDREN. Store in a cool, dry place. Do not use this product if the safety seal on the bottle is broken. If you suffer from redness in your checks or spider veins, this is a great product. I am an esthetician and several of my clients now take it also. Takes a couple weeks to work though.